The strikingly beautiful blooms of Strelitzia reginae are held confidently above luscious, banana-like leaves. A native of riverbanks and forest glades in South Africa, these exotic-looking flowers are also regarded as the emblem of Los Angles, where the species is extensively planted. The name Strelitzia is in honour of Queen Charlotte, Duchess of Mecklenburg-Strelitz (and wife of George III), who lived at RBG Kew for many years. 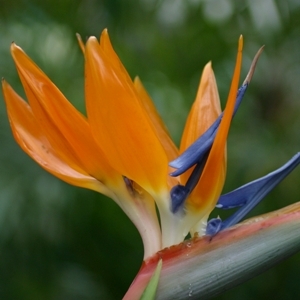 The common name ‘bird of paradise’ stems from the inflorescence’s intriguing resemblance to a tropical bird’s head. Pollination in the wild is by sunbirds, which sit on the boat-shaped bract to drink nectar, causing the flower to lever open and cover the bird’s breast with pollen. Provide this tender plant with moist, well-drained soil in a heated greenhouse or conservatory, and have your very own icon of the tropics!